Real estate investors and motivated home/property owners/sellers connect to buy and sell properties at discount price. Including residential homes/houses, industrial & commercial properties, farms and land properties such as FSBO, foreclosures, pre-foreclosure, estates & inheritance properties and REO sales below market value! We pay CASH FAST for houses and other real estate properties whatever your situation. If you are in a distressed situation (see list) that forces you to sell your property below the market value for immediate cash, this is the right place for you. Are you in one these situations? WE CAN HELP!!! LIST YOUR PROPERTY FOR FREE!!! WE GUARANTEE CASH OFFERS IN 24 HOURS!!! SELL YOUR REAL ESTATE/HOME NOW! We can help save your credit and your life for 10 years by quickly stopping the foreclosure process. We can give you cash to move, pay off other bills, and enjoy a stress-free life again. We can help you sell your house fast! No Agent! No Commissions To Pay!! We are very experienced real estate investors some with over 20 years of experience in the real estate field. We are private individuals that just want to help others using our expertise. We are interested in helping you to improve your situation. Stress can kill. We want to eliminate any stress associated with real estate by helping you as quickly as possible. We have bought houses and properties in every area nationwide and in every condition imaginable. In order to be affiliated with the service on this website, all real estate investors must pass a rigorous qualification process, including verifying their ability to pay CASH for properties and to do so very FAST. GET CASH FOR YOUR REAL ESTATE/HOME NOW! Real Estate Sellers (Home Owners, Property Management Companies, Real Estate Companies, REO Manager, Lenders, Note Holders and other Motivated Sellers) Submit Real Estate Listing. Real Estate Listing is sent to a nationwide network of Real Estate Investors (Individuals and professionals that have access to cash and interested to make money by helping distressed sellers by creating a win-win scenario - CASH for DISCOUNT properties) that have an interest in properties like yours. 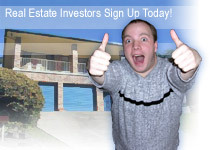 Real Estate Investors send offers via email or phone. Real Estate Seller and the Real Estate Investor contact each other and finalize the transaction. SELL YOUR REAL ESTATE/HOME FOR CASH! Furthermore, as a real estate investor you know the benefits of investing with a long-term vision in mind. These include benefiting from tax depreciations and reduction in liability. Appreciation and cash flow are also the excellent long-term strategy benefits. You might be interested in buying houses to rent, apartments, business buildings, or other commercial properties. Access Nationwide Motivated Sellers Leads! Sign Up Today! We have the property leads you are looking for! Visit our Real Estate Hotline! Real Estate Investor and the Real Estate Seller contact each other and finalize the offer.